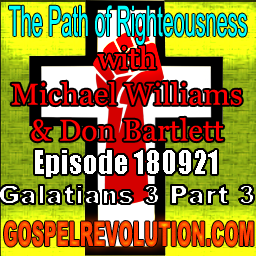 For the second week in a row, Mike and Don revisit the last half of Galatians 3 and extract even more nuggets. Hi there! Thank you for the effort brothers. I received little edification though as you are very regurlarly contradicting yourself and you are all over the show all the time. This is so confusing. The line you took regarding your effort to defend an angry, law pouring old testament God and then try to show Him as totally another character according to the work on the cross; providing righteousness and free atonement. Of course that implies that the interpretations by ‘men’ … of God … is the difference. He did not change character at all. Law ridden. unregenerated MAN gave us an angry jealous and punitive interpretation of God. You then talk the freedom through (rather sinically and sarcastically though) but obviously do not apply it in retrospect. It sounds as if you go for the absolute Inerancy of Scripture, while we came so far as to explain the whole memetic nature of man, as seen in the old testament interpretations. It really sounds like double-mindedness galore. Why did Jesus come then? If not for changing man’s fallen lawish fear ridden mindset – by metanoea. That part you do obviously see. Why then are we not allowed to re-interpret the good vs bad wrong tree interpretations seen in the old testament and the first gospels. Not nearly pulling your bottom lip over your face … But loosening the poor law-stretched bottom lip from behind your head. Strongs with that. Blessings!